Powerflex Black Rear Toe Link Arm Bushes for: Holden Malibu MK8 V300 (2012 - 2017). Unlike old technology Poly bushes any increase in vibration / harshness felt through the vehicle is normally undetectable. Powerflex Rear Toe Link Arm Bushes for: Holden Malibu MK8 V300 (2012 - 2017). Unlike old technology Poly bushes any increase in vibration / harshness felt through the vehicle is normally undetectable. Powerflex Black Rear Trailing Arm Bushes for: Holden Malibu MK8 V300 (2012 - 2017). Unlike old technology Poly bushes any increase in vibration / harshness felt through the vehicle is normally undetectable. EXH030BLK is location 30 on the diagram below. Powerflex Black Rear Exhaust Mounts for: Holden Cascada (2015 - 2017). Unlike old technology Poly bushes any increase in vibration / harshness felt through the vehicle is normally undetectable. EXH030 is location 30 on the diagram below. Powerflex Rear Exhaust Mounts for: Holden Cascada (2015 - 2017). Unlike old technology Poly bushes any increase in vibration / harshness felt through the vehicle is normally undetectable. Powerflex Rear Beam Mounting Bushes for: Holden Cascada (2015 - 2017). Unlike old technology Poly bushes any increase in vibration / harshness felt through the vehicle is normally undetectable. Bushes are one of the most highly stressed components fitted to a car. Powerflex Black Rear Beam Mounting Bushes for: Holden Cruze MK1 J300 (2008 - 2016). Unlike old technology Poly bushes any increase in vibration / harshness felt through the vehicle is normally undetectable. Powerflex Black Rear Upper Arm Outer Bushes for: Holden Malibu MK8 V300 (2012 - 2017). Unlike old technology Poly bushes any increase in vibration / harshness felt through the vehicle is normally undetectable. Powerflex Black Rear Lower Arm Inner Bushes for: Holden Malibu MK8 V300 (2012 - 2017). Unlike old technology Poly bushes any increase in vibration / harshness felt through the vehicle is normally undetectable. Powerflex Rear Upper Arm Outer Bushes for: Holden Malibu MK8 V300 (2012 - 2017). Unlike old technology Poly bushes any increase in vibration / harshness felt through the vehicle is normally undetectable. Powerflex Black Rear Panhard Rod Outer Bushes for: Holden Cascada (2015 - 2017). Unlike old technology Poly bushes any increase in vibration / harshness felt through the vehicle is normally undetectable. Powerflex Black Front Arm Front Bushes for: Holden Malibu MK8 V300 (2012 - 2017). Unlike old technology Poly bushes any increase in vibration / harshness felt through the vehicle is normally undetectable. Powerflex Front Arm Front Bushes for: Holden Cascada (2015 - 2017). Unlike old technology Poly bushes any increase in vibration / harshness felt through the vehicle is normally undetectable. Bushes are one of the most highly stressed components fitted to a car. Powerflex Black Front Arm Rear Bushes for: Holden Cascada (2015 - 2017). Unlike old technology Poly bushes any increase in vibration / harshness felt through the vehicle is normally undetectable. Bushes are one of the most highly stressed components fitted to a car. Powerflex Black Front Arm Front Bushes for: Holden Cascada (2015 - 2017). Unlike old technology Poly bushes any increase in vibration / harshness felt through the vehicle is normally undetectable. Bushes are one of the most highly stressed components fitted to a car. Holden Malibu MK8 V300 (2012 - 2017) Powerflex Black Rear Anti Roll Bar Bushes 20mm PFR80-1510-20BLK. Powerflex Black Rear Anti Roll Bar Bushes 20mm for: Holden Malibu MK8 V300 (2012 - 2017). Unlike old technology Poly bushes any increase in vibration / harshness felt through the vehicle is normally undetectable. Powerflex Black Front Engine Mounting Insert for: Holden Cruze MK1 J300 (2008 - 2016). Unlike old technology Poly bushes any increase in vibration / harshness felt through the vehicle is normally undetectable. Powerflex Rear Anti Roll Bar Bushes 20mm for: Holden Malibu MK8 V300 (2012 - 2017). Unlike old technology Poly bushes any increase in vibration / harshness felt through the vehicle is normally undetectable. Powerflex Rear Engine Mounting Insert Diesel for: Holden Cascada (2015 - 2017). Unlike old technology Poly bushes any increase in vibration / harshness felt through the vehicle is normally undetectable. Powerflex Front Arm Front Bushes for: Holden Malibu MK8 V300 (2012 - 2017). Unlike old technology Poly bushes any increase in vibration / harshness felt through the vehicle is normally undetectable. Bushes are one of the most highly stressed components fitted to a car. Powerflex Black Rear Engine Mounting Insert for: Holden Cascada (2015 - 2017). Unlike old technology Poly bushes any increase in vibration / harshness felt through the vehicle is normally undetectable. Powerflex Rear Lower Arm Inner Bushes for: Holden Cruze MK1 J300 (2008 - 2016). Unlike old technology Poly bushes any increase in vibration / harshness felt through the vehicle is normally undetectable. Powerflex Rear Engine Mounting Insert for: Holden Cruze MK1 J300 (2008 - 2016). Unlike old technology Poly bushes any increase in vibration / harshness felt through the vehicle is normally undetectable. Powerflex Front Arm Rear Bushes for: Holden Malibu MK8 V300 (2012 - 2017). Unlike old technology Poly bushes any increase in vibration / harshness felt through the vehicle is normally undetectable. Bushes are one of the most highly stressed components fitted to a car. Powerflex Front Engine Mounting Insert for: Holden Cascada (2015 - 2017). Unlike old technology Poly bushes any increase in vibration / harshness felt through the vehicle is normally undetectable. Fits 2.8, 2.0L petrol and diesel models. Holden Cascada (2015 - 2017) Powerflex Front Anti Roll Bar Bushes 26.6mm PFF80-1503-26.6. Powerflex Front Anti Roll Bar Bushes 26.6mm for: Holden Cascada (2015 - 2017). Unlike old technology Poly bushes any increase in vibration / harshness felt through the vehicle is normally undetectable. Powerflex Rear Trailing Arm Bushes for: Holden Malibu MK8 V300 (2012 - 2017). Unlike old technology Poly bushes any increase in vibration / harshness felt through the vehicle is normally undetectable. Holden Cascada (2015 - 2017) Powerflex Black Front Anti Roll Bar Bushes 26.6mm PFF80-1503-26.6BLK. Powerflex Black Front Anti Roll Bar Bushes 26.6mm for: Holden Cascada (2015 - 2017). Unlike old technology Poly bushes any increase in vibration / harshness felt through the vehicle is normally undetectable. Powerflex Rear Lower Arm Outer Bushes for: Holden Malibu MK8 V300 (2012 - 2017). Unlike old technology Poly bushes any increase in vibration / harshness felt through the vehicle is normally undetectable. Powerflex Front Arm Rear Bushes for: Holden Cruze MK1 J300 (2008 - 2016). Unlike old technology Poly bushes any increase in vibration / harshness felt through the vehicle is normally undetectable. Bushes are one of the most highly stressed components fitted to a car. Powerflex Black Rear Upper Arm Inner Bushes for: Holden Malibu MK8 V300 (2012 - 2017). Unlike old technology Poly bushes any increase in vibration / harshness felt through the vehicle is normally undetectable. POWERFLEX REAR LOWER ARM INNER BUSH PFR80-1513 OEM Part Number: 13219164 OEM Part Number: 22940360 Vehicle Fitment Guideline: Saab 9-5 YS3G 2WD (2010 - 2012), Buick LaCrosse MK2 (2010 - 2016), Buick Regal MK5 (2011 - 2017), Chevrolet Malibu MK8 V300 (2012 - 2017), Chevrolet Vectra MK1 (2008 - 2017), Holden Cruze MK1 J300 (2008 - 2016), Holden Malibu MK8 V300 (2012 - 2017), Vauxhall / Opel Insignia 2WD (2008-2017) Number of Bushes Included in Price: 2 Diagram Reference: 13 Important Notes: Vehicle tables are a guideline only. Please check OEM part numbers and sizes where provided. Powerflex Black Rear Lower Arm Outer Bushes for: Holden Malibu MK8 V300 (2012 - 2017). Unlike old technology Poly bushes any increase in vibration / harshness felt through the vehicle is normally undetectable. POWERFLEX REAR ENGINE MOUNTING INSERT DIESEL PFF80-1421R This part is designed to limit movement of the original voided rubber mount whilst being mindful of vibration transmitted to the vehicle and is recommended for diesel models. Powerflex Black Front Arm Rear Bushes for: Holden Malibu MK8 V300 (2012 - 2017). Unlike old technology Poly bushes any increase in vibration / harshness felt through the vehicle is normally undetectable. Powerflex Rear Panhard Rod Outer Bushes for: Holden Cruze MK1 J300 (2008 - 2016). Unlike old technology Poly bushes any increase in vibration / harshness felt through the vehicle is normally undetectable. Powerflex Rear Upper Arm Inner Bushes for: Holden Malibu MK8 V300 (2012 - 2017). Unlike old technology Poly bushes any increase in vibration / harshness felt through the vehicle is normally undetectable. 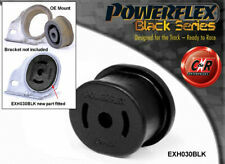 POWERFLEX FRONT ANTI ROLL BAR BUSH 26.6MM PFF80-1503-26.6 Please check anti roll bar diameter before ordering. OEM Part Number: 13281782 Size 26.6mm Vehicle Fitment Guideline: Saab 9-5 YS3G 2WD (2010 - 2012), Vauxhall / Opel Astra MK6 - Astra J (2010 - 2015) , Vauxhall / Opel Astra MK6 - Astra J GTC, VXR & OPC (2010-2015), Buick Cascada (2016 - ON), Chevrolet Cruze MK1 J300 (2008 - 2016), Chevrolet Orlando J309 (2011- 2018), Holden Cascada (2015 - 2017), Holden Cruze MK1 J300 (2008 - 2016), Vauxhall / Opel Insignia 2WD (2008-2017), Vauxhall / Opel Cascada (2013 - ON), Vauxhall / Opel Zafira C (2011 - ON) Number of Bushes Included in Price: 2 Diagram Reference: 3 Important Notes: Vehicle tables are a guideline only. Please check OEM part numbers and sizes where provided. POWERFLEX REAR UPPER ARM INNER BUSH PFR80-1511 OEM Part Number: 13219170 OEM Part Number: 13219163 OEM Part Number: 13318344 Vehicle Fitment Guideline: Saab 9-5 YS3G 2WD (2010 - 2012), Buick LaCrosse MK2 (2010 - 2016), Buick Regal MK5 (2011 - 2017), Chevrolet Impala MK10 (2014 - ON), Chevrolet Malibu MK8 V300 (2012 - 2017), Chevrolet Vectra MK1 (2008 - 2017), Holden Malibu MK8 V300 (2012 - 2017), Vauxhall / Opel Insignia 2WD (2008-2017) Number of Bushes Included in Price: 2 Diagram Reference: 11 Important Notes: Vehicle tables are a guideline only. Please check OEM part numbers and sizes where provided. POWERFLEX REAR UPPER ARM OUTER BUSH PFR80-1512 OEM Part Number: 13318343 OEM Part Number: 13239222 OEM Part Number: 13219163 Vehicle Fitment Guideline: Saab 9-5 YS3G 2WD (2010 - 2012), Buick LaCrosse MK2 (2010 - 2016), Buick Regal MK5 (2011 - 2017), Chevrolet Impala MK10 (2014 - ON), Chevrolet Malibu MK8 V300 (2012 - 2017), Chevrolet Vectra MK1 (2008 - 2017), Holden Malibu MK8 V300 (2012 - 2017), Vauxhall / Opel Insignia 2WD (2008-2017) Number of Bushes Included in Price: 2 Diagram Reference: 12 Important Notes: Vehicle tables are a guideline only. Please check OEM part numbers and sizes where provided. POWERFLEX REAR LOWER ARM OUTER BUSH PFR80-1514 OEM Part Number: 13239223 OEM Part Number: 13219164 OEM Part Number: 13213169 Vehicle Fitment Guideline: Saab 9-5 YS3G 2WD (2010 - 2012), Buick LaCrosse MK2 (2010 - 2016), Buick Regal MK5 (2011 - 2017), Chevrolet Impala MK10 (2014 - ON), Chevrolet Malibu MK8 V300 (2012 - 2017), Chevrolet Vectra MK1 (2008 - 2017), Holden Malibu MK8 V300 (2012 - 2017), Vauxhall / Opel Insignia 2WD (2008-2017) Number of Bushes Included in Price: 2 Diagram Reference: 14 Important Notes: Vehicle tables are a guideline only. Please check OEM part numbers and sizes where provided. POWERFLEX REAR TRAILING ARM BUSH PFR80-1517 PFR80-1517 Rear Trailing Arm Bush rectifies the commonly failed rear trailing arm bush due to twisting. Flexibility and articulation is also maintained through suspension travel from the use of our dual compound design. OEM Part Number: 13219149 OEM Part Number: 13219146 OEM Part Number: 22927294 Vehicle Fitment Guideline: Saab 9-5 YS3G 2WD (2010 - 2012), Buick LaCrosse MK2 (2010 - 2016), Buick Regal MK5 (2011 - 2017), Chevrolet Impala MK10 (2014 - ON), Chevrolet Malibu MK8 V300 (2012 - 2017), Chevrolet Vectra MK1 (2008 - 2017), Holden Malibu MK8 V300 (2012 - 2017), Vauxhall / Opel Insignia 2WD (2008-2017) Number of Bushes Included in Price: 2 Diagram Reference: 17 Important Notes: Vehicle tables are a guideline only. Please check OEM part numbers and sizes where provided. 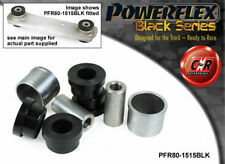 POWERFLEX FRONT ARM REAR BUSH PFF80-1502 PFF80-1502 Front Arm Rear Bush uses a rotating sleeve design to eliminate the common cause of the original bush failing due to the twisting forces acting on the rubber bush. OEM Part Number: 13257785 OEM Part Number: 13318886 / 13318887 OEM Part Number: 13360028 / 13360027 Vehicle Fitment Guideline: Saab 9-5 YS3G 2WD (2010 - 2012), Saab 9-5 YS3G XWD (2010 - 2012), Buick LaCrosse MK2 (2010 - 2016), Buick Regal MK5 (2011 - 2017), Chevrolet Malibu MK8 V300 (2012 - 2017), Chevrolet Vectra MK1 (2008 - 2017), Holden Malibu MK8 V300 (2012 - 2017), Vauxhall / Opel Insignia 2WD (2008-2017), Vauxhall / Opel Insignia 4X4 (2008 - 2017) Number of Bushes Included in Price: 2 Diagram Reference: 2 Important Notes: Vehicle tables are a guideline only. Please check OEM part numbers and sizes where provided. POWERFLEX REAR TOE LINK ARM BUSH PFR80-1515 OEM Part Number: 13219171 OEM Part Number: 13218171 OEM Part Number: 51755681 Vehicle Fitment Guideline: Saab 9-5 YS3G 2WD (2010 - 2012), Buick LaCrosse MK2 (2010 - 2016), Buick Regal MK5 (2011 - 2017), Chevrolet Impala MK10 (2014 - ON), Chevrolet Malibu MK8 V300 (2012 - 2017), Chevrolet Vectra MK1 (2008 - 2017), Holden Malibu MK8 V300 (2012 - 2017), Vauxhall / Opel Insignia 2WD (2008-2017) Number of Bushes Included in Price: 4 Diagram Reference: 15 Important Notes: Vehicle tables are a guideline only. Please check OEM part numbers and sizes where provided. 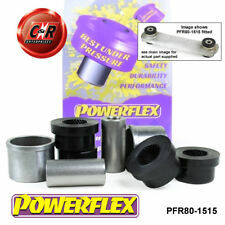 POWERFLEX REAR ANTI ROLL BAR BUSH 20MM PFR80-1510-20 Please check anti roll bar diameter before ordering. OEM Part Number: 13281790 OEM Part Number: 013281790 OEM Part Number: 00444091 Size 20 Vehicle Fitment Guideline: Saab 9-5 YS3G 2WD (2010 - 2012), Buick LaCrosse MK2 (2010 - 2016), Buick Regal MK5 (2011 - 2017), Chevrolet Impala MK10 (2014 - ON), Chevrolet Malibu MK8 V300 (2012 - 2017), Chevrolet Vectra MK1 (2008 - 2017), Holden Malibu MK8 V300 (2012 - 2017), Vauxhall / Opel Insignia 2WD (2008-2017) Number of Bushes Included in Price: 2 Diagram Reference: 10 Important Notes: Vehicle tables are a guideline only. Please check OEM part numbers and sizes where provided. Bushes set rear transverse and longitudinal rear HYUNDAI/KIA/HOLDEN/TOYOTA ---. Bushes set rear transverse and longitudinal rear HYUNDAI/KIA/HOLDEN/TOYOTA. 8 x 1308 - Wishbone rear transverse - 75 ShA / 85 ShA.